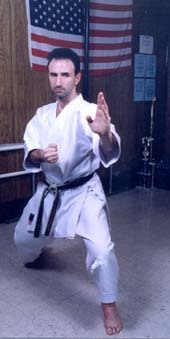 Steve Borkowsky has been training in Shotokan Karate for the past 38 years. He has been teaching karate for over twenty eight years and is the owner and chief instructor of Greenpoint Shotokan Karate Dojo which was established in 1990. Sensei Borkowsky has trained with some of the finest instructors and although his main foundation is Shotokan Karate he has also trained in various other combat disciplines such as Goju Ryu Karate, Wing Chun Gung Fu, Judo, Jujitsu, Aikido, Jeet Kune Do, Filipino stick fighting and western Boxing, Brazilian jujitsu. Over the years he has competed and placed in local competitions in both kumite and kata within the tri-state area. Within the Shotokan Karate community Sensei Borkowsky is known as a strong and dedicated karate practitioner. He has developed a teaching method that is exciting, fun and easy to follow. In addition to teaching Traditional Shotokan Karate, Sensei Borkowsky has developed the Great Shape Fitness Kickboxing Program where adults train in a fun, exciting, intense, Kickboxing class where they simulate kickboxing technique without actually fighting and getting hit. Up to 1600 calories are burned in this 1 hour. Sensei Borkowsky is a graduate of the Long Island University Karate Instructors Training Course and in 1993 was a member of the United States World Cup Karate Team. Put very simply he loves what he does. You will notice the energy and passion right away. If you embark on the karate path with Sensei Borkowsky, this energy and passion will pass on to you.